The technology has been hotly anticipated since it was first announced in a blog post back in September 2017. Interest in what functionality would be available and how we can expect to utilize it has steadily increased with each teaser and nugget of information released by the Cloudflare team. We are strong advocates of the Cloudflare service here at Leader Internet and previously discussed what Cloudflare does for PageSpeed on websites while making them secure. We applied to be part of the Worker Beta when it was first announced and received early access ago a couple of months ago. Since then, we’ve been experimenting with the features and had conversations with members of the Workers team to provide feedback and improve our knowledge of what it can do. The technology is so new it’s hard to find a good Cloudflare Workers Review but we are perfectly placed to offer our opinions as early access users. Developers have always had two places to deploy their code. The client side or the server side. Static code is generally done in the browser and any dynamic responses need to go all the way to a server. When we first heard about Workers we immediately started investigating could the tech be used to add interactivity to static websites, which are an emerging Trend In Web Development due to of the speed and simplicity they offer. For anyone operating static sites, 99% of the time, things are fine but there will always be that one occasion when some computation is needed instead of sending back a static response. Enter Cloudflare Workers. Developers can handle these requests and respond dynamically before they even reach the server. There is no post load computation and Workers respond so fast in the background, the transition is unnoticeable. Only if a Worker cannot send a response back to the user's browser, the request will be passed onto the origin server. Workers can also be deployed via the API but no need to complicate things at first. You can make changes directly within the dashboard and test them using the preview panel. Workers go live immediately so make sure not to activate them site wide. Setup a test page or experiment one for a low traffic URL. This can be specified in the routes panel of the worker. To test the functionality of Workers, we set up a few experiments. One of our clients has a site that takes traffic from two countries - UK and Ireland. They had a problem that everyone was landing on the UK version, which is no good for Irish customers because the prices are in pounds instead of euros. When reviewing the Cloudflare Workers docs, we realized it’s possible to read request headers in the worker code. Furthermore, Cloudflare detects the origin IP of the incoming request and appends a two-letter country code. This allowed us to write a simple worker that checks the country code and then redirect to the appropriate version if it exists. The most common approach is putting them behind a firewall or HTTP Basic Authentication but both of these options require server level changes, which take time and can be beyond the skills of some developers. Even if someone has the knowledge, bashing around on the terminal is an unpleasant and error-ridden procedure. The site content is not super sensetive so we just need a lightweight way to block them off to prying eyes. 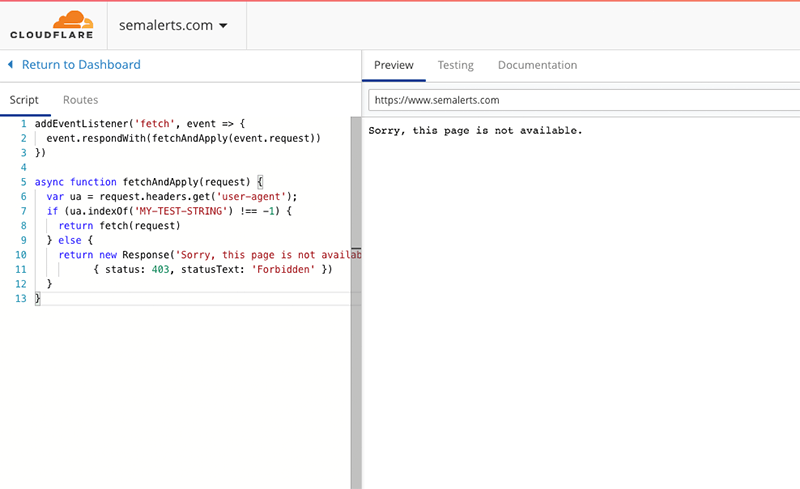 As Workers allow us to read request headers, we can block all traffic to a test site unless it has a specific header. Then all we have to do is install a Chrome Header add-on, insert our test string and allow this in the Worker JS. This allows us to restrict access to test sites from the outside world without SSH’ing onto a server but also allow our developers access to them in a quick and simple way. Cloudflare Workers give us the ability to analyze the requests before they reach the origin server. They are part of a wider industry shift towards serverless architecture and Edge Computing where computational code is located close the user instead of centrally stored on a web server. Knowledge of the Workers and documentation is still sparse so it may be a while before these features are fully utilized but the power they give developers should not be understated and as understanding improves more use cases will be uncovered. As Cloudflare powers 7 million websites we believe their products like Workers are going to have a large part to play in the evolution of the web. and will be investing our time in exploring them more. 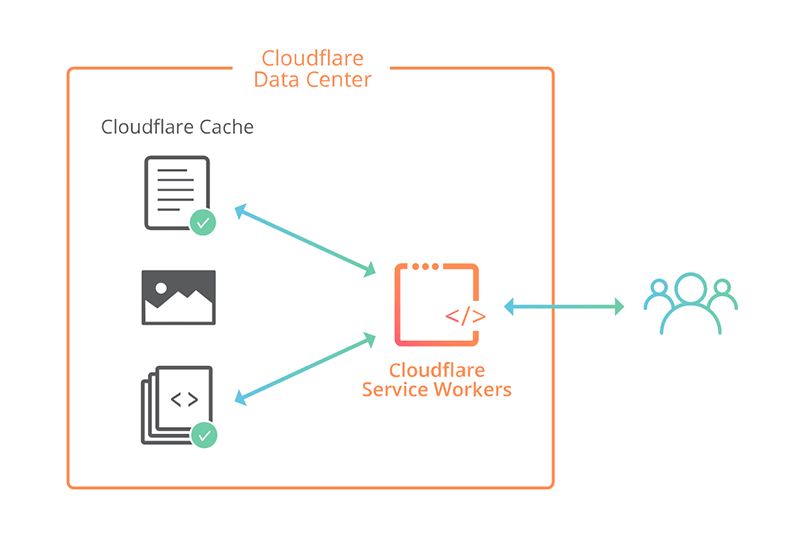 What do you think of our Review Of Cloudflare Workers? Let us know in the comments below. We welcome all feedback both good and bad.